Santa Clara Bruins’ starting pitcher Zach Penrod fearlessly attacked the strike zone from start to finish Tuesday afternoon. The senior would go the distance for a complete-game shutout. 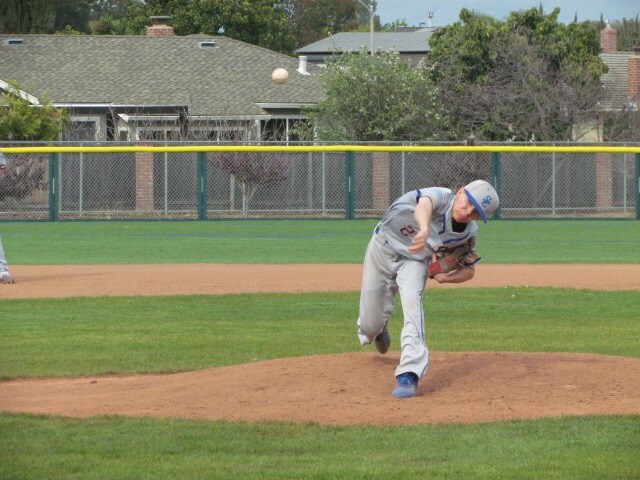 Santa Clara hitters scratched out three runs of support in the victory over Fremont. Penrod was rarely in trouble as not a single Fremont base runner reached third base in the game. A highlight-reel defensive play for the Bruins came in the bottom of the seventh when center fielder Jake Millett sprinted about 25 yards back towards right-center field and made a nice high back-handed, leaping catch. Other than that, Penrod kept the Fremont hitters from barreling the ball. While the Bruins’ offense mustered just three runs, they did give Penrod a 1-0 lead before he even took the rubber. Santa Clara left fielder Connor Valory led off the game by smoking the very first pitch down the left field line for a single. Valory would take advantage of a bobble on the play, ending up at second base. Second-place hitter Justin Cedro would follow up with a bunt single and Valory would come home to score on the overthrow at first base. The Bruins would add a run in the fourth to go up 2-0. After an error and a couple of singles, freshman third baseman Jayce Dobie dropped a bunt down with Gabe Lopez sprinting home on the pitch. It was a dangerous squeeze play as the bases were loaded and there was a force at any base. Dobie dropped the perfect bunt though for the RBI. In the seventh inning senior Jordan Davis roped a solid pinch hit single. Penrod’s younger brother Tyler Penrod would pinch run. The junior swiped second on a ball in the dirt. Soon after as he was stealing third, the throw went into left field allowing him to jog home for a 3-0 lead. Santa Clara has now won four games on the season, tying their total for all of last season. The Bruins will look to improve to 5-3-1 when they host Fremont on Thursday, March 21.